Augustus Plummer Davis, son of Anthony and Mary Davis, was born into a family of distinguished American patriots on May 10, 1835 in the little town of Gardiner, Maine. The Davis family came to the New World from Wales in 1670 and settled in Massachusetts, soon becoming active in local politics. In 1730, Isaac Davis, great-great grandfather of A. P. Davis, was born on the family farm outside of Acton, Massachusetts. His son, Jacob, was born on the same farm in 1760. Both of these men were avid supporters of American independence and possessed an unrelenting distaste for British soldiers. The Acton Militia elected Issac Captain. Jacob also served in the same militia. Early on the morning of April 19, 1775, Isaac received word that the British were moving towards Concord. He called out the Acton Militia. Under Captain Davis, these Minutemen rushed to Concord where they took a position in the center of the line at the North Bridge. Lead by Captain Davis, the Acton Militia were the first onto the bridge. One man preceded Captain Davis. He fell wounded. Captain Davis was immediately struck by a British bullet and was mortally wounded — the first American casualty of the War for Independence. Jacob followed in his father’s footsteps and distinguished himself throughout the Revolutionary war. During 1785, Jacob Davis II, son of Jacob, was born in Maine. Jacob, grandfather of Augustus, answered his countries call and served in the War of 1812 as the Captain of his company. In private life, he devoted his efforts to local politics and the family farm. His son, Anthony G. Davis, was born in 1810 in Gardiner, Maine. He married Mary H. Plummer. Augustus P. Davis had an uneventful early life. Being an adventurous lad, in 1849 at the age of 14, he took a job as a sailor on a freighter bound for San Francisco and the California gold rush. Once in California he remained there for about a year. With less han spectacular success in the gold fields and a strong calling to the sea, he once again took to the oceans in 1850. For the next five years he sailed the seas as a deckhand on various freighters. Always intrigued with military life, Davis combined it with his love of the sea and volunteered for service in the English Navy when the Crimean War erupted. For the next four years he served on man-o-wars. At the conclusion of his service with the Royal Navy he returned to the United States and promptly joined the United States Navy. He mustered out of the Navy in 1860 as a Petty Officer and returned to the family farm in Gardiner, Maine. Within a few months Fort Sumter was besieged by the South Carolina militia. Answering his Nation’s call as had his ancestors, on May 12, 1861 at the age of 26, Augustus volunteered for duty with the 11th Maine Infantry. He was immediately elected Captain of Company F. Davis and his company trained in Maine, then moved to Washington. Upon arrival in Washington, DC, the Regiment was assigned to General Casey’s Division, Army of the James. The 11th Maine continued to train throughout the fall of 1861 and went into winter camp in Alexandria, Virginia. On April 6, 1862, Captain Davis was unexpectedly detached from Company F, 11th Maine Infantry and permanently detailed as Provost Marshall of Casey’s Division. The Division soon became involved in the Peninsular Campaign. On May 31, 1862, Augustus was wounded in his left side and left leg at the Battle of Fair Oaks, Virginia. He spent the next several weeks at a field hospital. In the fall of 1862, he returned to the Division near Suffolk, Virginia. Plagued by ill health he tendered his resignation on February 4, 1863. The resignation was accompanied by a surgeon certificate dated the same day and signed by Dr. D. W. Hand, Surgeon and Medical Director Peck’s Division. It states …he has tubercular deposits in the right lung, with pleuritic adhesions on that side. In consequence, I believe the exposure incident to field service will very soon assuredly break down his health. In Special Order 7, paragraph 8, Department of Virginia dated February 7, 1863, A. P. Davis’ resignation was officially accepted. However, it is clear that he did not follow through with the resignation. For upon returning to Maine, he was appointed Provost Marshall of the 3rd District of Maine. Affidavits in his pension file confirm this service and his military records show his actual discharge date as August 15, 1865. Davis was appointed to brevet Major in the Volunteer forces to be effective March 13, 1865 by General Order 65, War Department, dated June 22, 1867. Following the War, Davis worked the family farm near Gardiner, Maine and served as a timekeeper at a nearby quarry on Dix Island. In 1866, Augustus married Mary Ann Gilpatrick. They had one son, Herbert Anthony Davis, born January 27, 1868 at Dix Island, Maine. Unexpectedly, Mary Ann died on March 11, 1872 at Dix Island. Her death raised many suspicions. These were exacerbated when Davis married Lizzie E. Parks only three months later. Mary Ann is buried in Gardiner, Maine. Davis’ health had continued to decline and immediately after his marriage to Lizzie, moved the family to Pittsburgh, Pennsylvania. His doctor had advised him to move to a drier climate. Pittsburgh, not noted for being a dry climate, was an unusual choice and only added to the rumors surrounding Mary Ann’s death. At Pittsburgh, Davis established himself in the insurance business, primarily providing insurance services to manufacturing concerns. A year after their arrival in Pittsburgh, Charles K. Davis was born. Charles eventually moved to Estes, Colorado and is buried there. Augustus and Lizzie had a tumultuous relationship. Eventually Augustus sued Lizzie for divorce. The divorce was finalized on June 9, 1876, by the Court of Common Pleas in Allegheny County, Pennsylvania. The divorce was exceptionally hard on the two boys. Lizzie was given custody of Charles and Herbert remained with Augustus, as Lizzie was not his natural mother. It is interesting that while A. P. Davis sued Lizzie for divorce on grounds of infidelity, on June 22, 1876, a scant two weeks later, he married Nancy E. Fulton. Still suffering the effects of his maladies from the War, A. P. Davis filed a pension application #102297 on September 28, 1869. Initially, the pension was granted. However, on June 5, 1876, the pension was suspended when a number of complaints were received from residents of Gardiner, Maine. A number of individuals from Maine came forth and submitted sworn statements that Davis had a respiratory affliction since early childhood and his mother had died of consumption. The War Department and Interior Department launched an investigation into the allegations of ineligibility for his pension. Supporting documents in the pension file only speak of Augustus medical conditions and not the other allegations. H. M. Plaisted, Member of Congress, late Colonel of the 11th Maine Volunteers, in his affidavit states that he believes that Davis acquired his illness as a result of his service during the Civil War. In his statement to the Pension Board, dated December 27, 1876, A. P. Davis explains at length how he contracted his illness while in the service and vehemently denies he had any related illness as a child. For the record, it should be noted that neither A. P. Davis or any other individual ever disputed the allegations of abuse. While the veracity of these statements cannot be verified, it is very clear that A. P. Davis was not well-liked in his home town. The pension was eventually reinstated on March 9, 1886 with payments retroactive to February 22, 1877. As he continued to press his case for a pension, Augustus built a life for himself, Nancy and Herbert in Pittsburgh. His insurance business flourished and as the business grew so did Augustus’ social status. His membership in the Grand Army of the Republic (GAR) provided him with numerous business and social contacts. Alexander Hays Post 3, GAR was dominated by the captains of industry, political leaders, judges, lawyers and doctors. Its members included every Judge of the Court of Common Pleas of Allegheny County, the Mayor of Pittsburgh, all of the County Commissioners, state legislators and senators, Congressmen and names such as Negley, Neville, Craig, Hays, Melon and a plethora of other important Pittsburgh families. The rejected applicants included Andrew Carnegie who had been ruled ineligible for membership. Carnegie had been responsible for the design, construction, implementation and command of the Union telegraph system and was under the direct control of the Signal Corps. The Pennsylvania Department Commander relying on rulings of Commanders-in-Chief ruled he was a civilian employee of the War Department even though he possessed a discharge and was thus not eligible for membership. Davis was active in other Civil War related veterans organizations. He was a member of the GAR, the Society of the Army of the James and the Society of the Army of the Potomac. He was one of the founding members of the Union Veteran League and a member of the Union Veteran Union. On January 14, 1880, he was elected to the Pennsylvania Commandery, Military Order of the Loyal Legion of the United States, Class I, Insignia Number 1981. He was one of the first members of the Fort Pitt Chapter of the Sons of the American Revolution. Davis was also a member of the Knights of Pythias and several Masonic Orders. In July 1877, Davis made his first proposal for an organization of sons of GAR members. The proposal was resoundingly rejected by the members of Post 3. Over the next four years, Davis made at least three additional attempts to gain approval of the members of Post 3 to organize their sons. A young boys drum and bugle corps was actually begun only to be rejected by the Post members. Finally in September 1881, the Post 3 members took a neutral position on Augustus’ latest proposal. They would not endorse his plan, nor would they oppose it. David had devised a plan to organize the sons of members of the GAR into a military style organization whose purposes would mimic those of the GAR and additionally be bound to provide assistance to the members of the GAR. Membership was limited to the eldest living son of a GAR member. The first organization meeting was held November 12, 1881 in the GAR Post 3 meeting room, 3rd floor of the Old City Hall. A group of eight boys meet and adopted the constitution, rules, regulations, and ritual written by A. P. Davis and formed the Sons of Veterans of Pennsylvania. They elected officers and thus was born the organization today known as the Sons of Union Veterans of the Civil War. Articles of Incorporation were filed on December 28, 1881, and approved by the Court of Common Pleas the same day. The Commonwealth of Pennsylvania approved the charter on January 12, 1882. Augustus fervently devoted his time, energy and money to the proliferation of the Sons of Veterans of Pennsylvania. Camps were formed throughout Pennsylvania, Eastern Ohio, Northern West Virginia and Southern New York. By mid year it was apparent that there was a need for a formal organization within Pennsylvania. On July 4, 1882, the Division of Pennsylvania was created and the first Division Encampment held in Pittsburgh. Throughout the summer of 1882, the organization grew geometrically. By fall, there was a pressing need for a National Organization. On October 18, 1882, the first National Encampment was held in Pittsburgh. The constitution, rules and regulations proposed by A. P. Davis were adopted and the name of the corporation changed to Sons of Veterans of the United States of America. A. P. Davis’ grandiose vision of organizing the sons of veterans had become a reality. But the scope of his plan went far beyond simply organizing the sons. His plan is encapsulated in his own words. The Sons of Veterans is destined to become the great military organization of the country, that glory of its supremacy, that healing of the sense when its National hymn are sung that none other not thus reared can know or feel. Through this organization the declining days of the Union Veteran will be made pleasant, his record of service to his country preserved, his memory honored, patriotism promoted. While if the dire necessity of the Nation should dictate, the Sons of Veterans, uniformed, drilled and equipped would come at once to her defense with the glory of their fathers surrounding them, each heart pulsating in unison with the rising and falling of the Nation’s emblem. And who would be powerful enough to prevail against such a host? 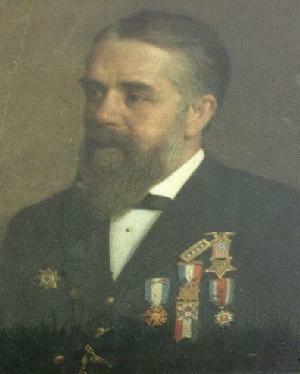 For all his devotion to the Sons of Veterans, USA, Augustus P. Davis was declared a Past Commander-in-Chief and Past Grand Division Commander in August 1884. On April 9, 1885, A. P. Davis deposited his membership with Davis Camp and was entered upon the rolls. Final and complete acceptance by the GAR came in 1888. In his report to the National Encampment of the GAR, Commander-in-Chief John P. Rea stated, “It will be but a short period until our ranks are so meager and the surviving Comrades so weighed down with the burden of years that our organization will have ceased to be an active force in the work of loyal love and charity which it has ordained. The tender ceremonies of Memorial Day will then be performed by others or not at all. It seems to me that it would be the part of wisdom for us while yet in our vigor to establish such relationship between our Order and the Sons of Veterans as to properly recognize the organization.” As a result of Commander-in-Chief Rea’s presentation the GAR adopted the following resolution. During the 1890 National Encampment in St. Joseph, Missouri, A.P. Davis recounted the early history of the SUVCW in an interview with a reporter from the St. Joe “Ballot” published on August 25, 1890. I had an idea that there should be some such an order as the Sons of Veterans for some time before its organization. A number of others shared the opinion with me, but when I would bring the matter before the Grand Army encampment, a majority would be found opposing it and the matter would be set aside. In the year of 1880, I organized a “junior marching band” composed of small boys and it was so much of a success Mrs. Davis and my son urged me to organize a permanent organization. The matter came before us strikingly by the events of Memorial Day. Who would strew flowers on the graves of heros when the shattered fragment of the Grand Army was no more?? I went to work on the prospectus, mapped out the constitution, and endeavored through that summer unsuccessful with my project. “On November 12, 1881, I got together with eight boys, and the first camp of the Sons of Veterans was organized. Two weeks later we met again and exemplified the ritual, and adopted it. In December of 1881, I mustered in a camp at Allegheny City. That was the second camp of the order…. In January 1882, I mustered in a camp at McKeesport, Pa., and another camp in Pittsburgh, Pa. … the order was sufficiently advance to form a division. The meeting was held in Pittsburgh and Division constitution and by laws were adopted. Officers elected. At about this time the Order began to spread to other states, by the aid of Comrades in the Grand Army of the Republic. I did not hesitate to urge every Comrade to lend the weight of his influence in its favor. And I soon found that sufficient interest had been aroused to flood me with letters and correspondence from every quarter. in July 1882, the movement had met such success and rapid progress that I decided in the absence of Col. Rowley, who was away for his health, to declare him provisional Commander-in-Chief. And erected a national organization. We also divided the United States into five Grand Divisions. Shortly after, acting Commander-in-Chief Rowley issued a call for the first national encampment to be held in Pittsburgh, Pa. October 18, 1882. This meeting was not a large one, but as successful as could be expected. At that encampment a regular national organization was made. A constitution, rules and by law that I had previously prepared were adopted and a set of national officer were elected. The Order is stronger, healthier and better conditioned today than ever and another year will show progress greater than any other year in the past. The Order will go on and increase until I am unable to see when the flood tide will be reached. There was a time when it was an experiment, and a good many did not agree with me. I had a great deal to discourage me and to cast me down, but I never had a fear for its ultimate success. Much credit for the success of the Order is due to the Grand Division officers, as well as hundreds of Comrades of the Grand Army all over the land, who were kind to me and my infant adventure. A.P. Davis’s “infant adventure” had indeed been successful. At the time of the 1890 National Encampment he reported the total membership at 145,000. The number would eventually reach it pinnacle of slightly more than 200,000 in 1904. Throughout the remainder of his life A.P. Davis continued to foster the growth of his beloved Sons and the Ladies Aid Society [later to change its name to Auxiliary to the Sons of Union Veterans of the Civil War] which he had founded in 1884. He developed incentive programs for those who recruited new members and traveled extensively promoting the Order. His health continuing to decline, A.P. Davis was confined to bed by his doctor in the fall of 1898. After a prolonged illness, he answered his final muster call at 6:00 AM May 21, 1899 at his home — 6335 Howe Street, Pittsburgh, Pennsylvania. On May 22, 1899, the following notice appeared on page one of the Pittsburgh Press: “A mass meeting of the Sons of Veterans of Pittsburgh, Allegheny and vicinity is called to meet tonight at 7:30 PM in the Armory of CO A, 14th Regiment, in Old City Hall to take suitable action regarding the death of Major Augusts P. Davis.” The number of Sons attending the meeting was so great they could not all be accommodated. At the behest of Mrs. Davis, it was the Sons of Veterans burial service which was conducted. The pall bearers, honor guard, and firing squad were all from his beloved Sons. Even his Comrades of GAR Post 3 conceded that it was more fitting that the Sons conduct the service than they. The four swords (4) that I used at different times during the late Civil War. The belts (2 in all) for the same which I desire shall be restored and put in order, also my military sash. My spurs and field glasses. My commission from the Governor of the State of Maine and the President of the United States. My certificates of membership in the carious Military and Civil Orders to which I belong. The coat and vest buttons used by me during the late Civil War. Any other articles that my wife Nancy E. Davis desires shall be included in this list. On March 6, 1902, the Commandery-in-Chief of the Sons of Veterans of the United States declined to accept the $500 legacy. The personal property was accepted. Regardless of the unsubstantiated allegation about Augustus P. Davis character made by those opposed to his pension, his later life did not give any indication of such behavior. The readers are left to decide for themselves the true character of the man.